Gold braces are comprised of high-grade stainless steel coated with 24-karat gold. An extremely popular option, they offer a distinct look that patients of all ages love. They’re also very similar to traditional metal braces in that they work exactly the same way. The only difference is their appearance – which means the right choice for you will depend on your unique personality and personal style. Your gold braces treatment will begin during your initial consultation at 360 Orthodontics. During that meeting, Dr. Partovi will perform a careful examination of your mouth – taking x-rays, measurements and impressions. This allows her to assess the severity of your dental issues, while creating a customized plan to correct them. If you decide to move forward with gold braces, Dr. Partovi will use a special dental cement to attach tiny brackets to each of your teeth. From there, she will connect the brackets with a wire and elastic rings. Throughout your treatment, you will return to the office so Dr. Partovi can check in on your progress and tighten your braces periodically. In this way, she applies the precise amount of pressure necessary to shift your teeth and align your jaw – producing the ideal smile you deserve. Please take a moment to view our before and after gallery, to see for yourself the dramatic results you can expect to achieve when you undergo a tooth contouring procedure with Dr. Partovi. There was a time when braces were very painful. However, that’s no longer the case. 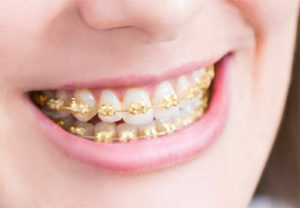 Thanks to profound advancements in the dental industry, straightening your teeth with gold braces is now an extremely comfortable experience. As such, the appointment during which your gold braces are placed will be entirely free of pain. However, you may feel slight soreness in the days that follow, and after each time your braces are tightened, due to the movement of your teeth. To manage this discomfort, Dr. Partovi recommends eating only soft foods for awhile and taking an over-the-counter pain reliever. How much do gold braces cost? Because every patient’s dental issues vary in severity and require a different length of time to achieve an optimal outcome, the final cost of your gold braces can vary greatly. 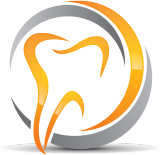 After evaluating your teeth, mouth and gums during your initial consultation, Dr. Partovi can provide you with a comprehensive quote, outlining all of the costs involved so you’re completely prepared for the investment. Dr. Mahtab Partovi earned her degree from the esteemed New York University College of Dentistry. After dental school, Dr. Partovi completed her residency at Jacksonville University School of Orthodontics, where she worked alongside celebrated orthodontists. Through her intensive studies as well as cutting-edge industry knowledge, Dr. Partovi has become a leading orthodontic provider. Dr. Partovi has successfully developed new, innovative approaches to traditional orthodontic procedures to provide her patients beautiful results. Dr. Partovi’s revolutionary method has allowed patients to find their smiles with her better faster easier approach. As a respected member of the Los Angeles dental community – Dr. Partovi is proud to offer a wide selection of orthodontic treatment options for her patients. In addition to traditional, self-ligating and lingual braces; Dr. Partovi has developed her own, unique solution for Invisalign patients. As the innovator of this distinctive Invisalign concept, it has been named The 360 Method. The 360 Method allows patients to enjoy the benefits of a smooth, seamless smile during Invisalign without any visible signs of ugly attachments on their teeth. Dr. Partovi is the only Orthodontist to use this truly Invisalign approach. By doing so, patients have been able to secretly achieve straighter teeth without anyone noticing. Having expertly corrected crooked teeth for thousands of individuals over the years, Dr. Partovi is among the most qualified orthodontists available to help you achieve the beautiful and healthy smile you’ve always wanted. Discover for yourself why thousands of patients have already trusted Dr. Partovi with their smiles! Book your appointment with the smile experts at 360 Orthodontics today!